Robert started his real estate career as a licensee in 1986 and knew since he was about 14 years old that this was the career path he wanted to follow. He has based his career on serving the community, helping to educate the community on real estate matters, working diligently to uphold professional standards in the profession, and providing assistance to those in need of guidance throughout the years. Robert has also been called upon and continues to be called upon by the real estate industry to assist and educate fellow real estate practitioners on a variety of topics including professional standards, technology, and numerous other topics that he has been asked to train fellow real estate agents on. He has held a position as a State Director and Vice-Chair for the California Association of REALTORS®. 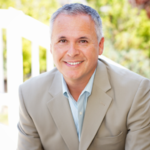 He was also once a nationally syndicated real estate journalist and has also been featured in the San Jose Mercury News, AOL News, Forbes, Inman News, Business Week, and many others. Robert appeared on HGTV’s hit show “Sleep on It” and NBC’s “Best of the Bay”, and was also the host of TV and Radio’s “Let’s Talk Real Estate!” for over 15 years. Robert was voted Man of the Year in Scotts Valley for his contributions to the community in 2014. Robert is the agent chosen by more Scotts Valley home sellers and buyers then any other agent or team in 2015, 2016, and 2017. He was also awarded the Santa Cruz Sentinel’s Readers Choice for Best REALTOR® in Scotts Valley for two years straight, 2016 and 2017, and was awarded Favorite Real Estate Agent in Scotts Valley for 2017 by local residents in the NextDoor Favorite Business Awards. He has lived in Scotts Valley since 1996 along with his wife, Monica, their three daughters, Haley, Madeline and Ava, two sweet cats, and one special dog.